Danica is trapped in something that was very much a reality for women, and still is: an abusive relationship. Of course, there are the outstanding circumstances of everything involving life at court – but the most basic layer of the story is the same – escape. Danica is no helpless damsel, let me tell you. She takes things into her own hands, though her means are neither honorable nor was it something I respected in the slightest. She starts dealing drugs, specifically: a dangerous, new, highly volatile and addictive substance called Glitter which she secretly mixes into cosmetics and sells to unknowing men and women. It is a desperate attempt to make enough money to flee the king – whom she has very recently watched choke a woman to death. So yeah, she’s desperate, and it’s warranted – it does not condone her actions, but hot damn does it make for one hell of a heart pounding story. The world of Glitter is so completely and utterly unique. It completely turns Historical Fiction on its head. Not only do we get the extremely realistic depiction of life in French court at the times of Marie Antoinette, we also get a seamless blending of real world technology and a dystopian level society. It was fascinating, all-consuming, and I’d be lying if I didn’t say it was also the slightest bit as intoxicating as Glitter itself. As for the characters, they, too, were thrilling. The king was terrifying, as he should have been – but he was also human in a way that made it all the more so disturbing. Dani’s friends, Molli and Lord Aaron, were a welcome breath of fresh air in the hell-hole that is Sonoman-Versailles. Then we have Saber, who I adored in all senses of the word. That man was seriously swoon-worthy and he wasn’t even trying to be! Ugh, there is so much sexual tension between him and Danica at their first meeting and thereafter, it drove me nuts in the best way possible. Plus, he’s just awesome. I can say no more less I spoil it for all of you lovely people. Then we have Danica, or Dani, whom – despite her bad choices – I still loved as a protagonist. I found it extremely refreshing to have a main character who was not perfect, who does the wrong thing for personal gain and continues to do so, and who owned it. Dani is under no delusions that she is doing something for the right reasons, she knows what she is doing is god awful, but she does it anyway. She is selfish and pretty much unlikable, but you start to like her anyway? Like, WHAT SORCERY IS THIS! It’s a case of when you know you’re not supposed to like something and you end up liking it anyway. This cast of amazing characters is so morally gray. No, actually it’s beyond that. They are not morally gray, they are all complete scoundrels but some are simply the lesser of the two evils. I loved it. 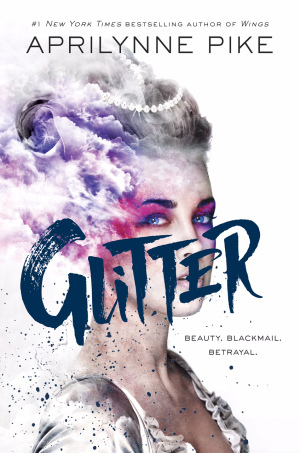 Glitter is a whirlwind of a read, and I wouldn’t have it any other way. It highlights just how invaluable karma and getting yours really is. Glitter destroys the notion that all is glitter and gold, replacing it with a far more dismal and realistic sense of helpless monstrosity. No one is perfect, least of all a Queen.